As we continue into the 21st century, higher education plays an increasing role in determining people’s life chances. Success at the college level is a key individual stepping stone to full participation in society and economic security. At the same time, having a well-educated workforce is an important component in maintaining the region’s position in an increasingly complex and competitive world system. The extent to which our primary and secondary schools are preparing their students for college-level work is a key element. 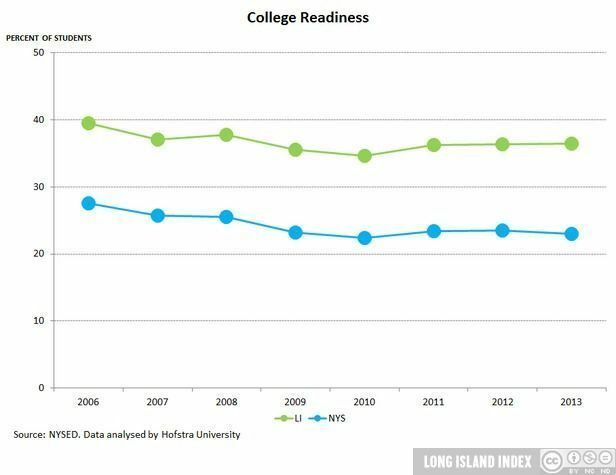 Measuring college readiness: High percentages of graduates receiving Regents Diplomas reflect strengthened standards through the secondary school level. However, while such measures reflect passing grades in coursework and on statewide examinations, they do not assess the extent to which students are actually prepared for meeting the academic demands of college-level work. Research in this area has demonstrated that one of the best predictors of college-level success is students’ grade point averages at the high school level. This makes logical sense since students with high average grades are, by definition, those who have done well in coursework across the breadth of their high school curriculum. Students who demonstrate curricular mastery at the high school level are more likely to be able to meet the academic challenges of college level studies. We have thus devised a measure of curricular mastery based on average school-level performance across multiple Regents Examinations. For each high school, we recorded the percentage of test takers scoring 85% and above across Regents Examinations in the areas of English, History, Chemistry, Physics, and the two highest-level Mathematics courses. By presenting school-level data across the curriculum on the percent of students who perform very well, we provide a relative measure of how well schools are preparing their students for the rigors of college-level work. Overall, Long Island schools outperform New York high schools. On average Long Island high schools reported that 36% of Regents Examinations taken in 2013 scored at least 85%. State-wide, the 2013 rate was only 23%. The overall pattern between 2007 and 2013 is essentially one of consistency around the 36-37% levels. As with other educational indicators, the school-level measure of college preparedness is strongly correlated with poverty. Low-poverty schools report very strong scores on our measure of college readiness (55% in 2013), but high-poverty schools report much lower scores (14% in 2013). High schools with a large percentage of economically poor students face a much greater challenge in academically preparing their students for college. With the large gap in college readiness noted, the trend for all three poverty categories from 2006 to 2013 is largely flat, although low-poverty schools showed an anomalous dip in 2011 followed by a rebound in 2012. 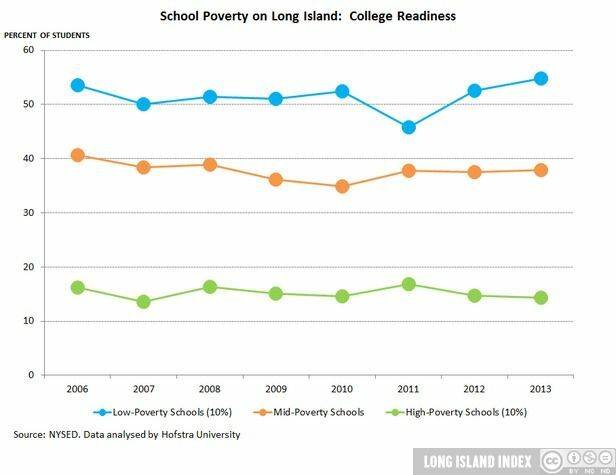 Overview: While Long Island schools do well on average, there are wide disparities among schools depending on the neighborhoods they serve. Blacks and Hispanics are concentrated in high-poverty schools, perpetuating the economic disparities among racial and ethnic groups.